While you may have heard of tennis elbow, another injury affecting the arm is common: tennis shoulder. If you feel twinges of pain in the shoulder after a tennis session that develops over time, this can be an indicator your tennis shoulder pain is developing into a more serious condition. You can take steps to prevent tennis shoulder pain that do not involve taking yourself away from the court too long. Shoulder pain from playing tennis can be traced back to the mechanics of your overhand tennis swing. When you hit a tennis ball overhead, an estimated force of 120 percent of your bodyweight shocks your rotator cuff. While these muscles move the arm and shoulder, the repeated impact can contribute to pain and inflammation in the shoulder joint. Further complicating this is the fact that tennis strokes work the front of your shoulder but don't necessarily target the back of the shoulder. This muscle imbalance can result in greater pain to your shoulder with each ensuing tennis session. 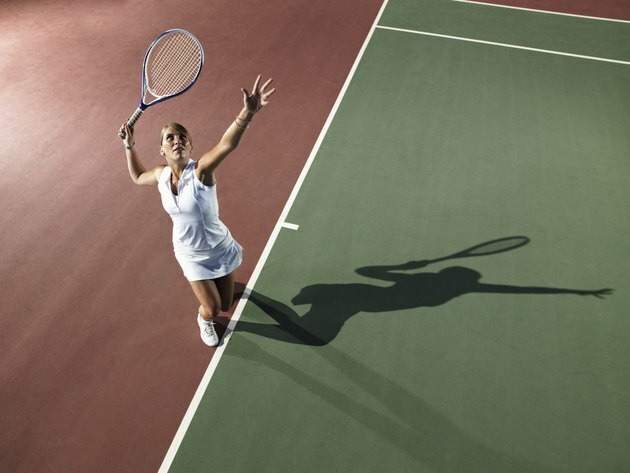 Paul Borsa, an associate professor at the University of Florida who was interviewed in The New York Times, likens the rotator cuff motion in tennis to the brakes of the shoulder. When you hit the ball overhanded and your rotator cuff muscles are underdeveloped, it is like "all acceleration and no brakes," Borsa says. Sometimes a sore shoulder or shoulder pain after tennis will subside with a day's rest and icing of the affected area. However, sometimes shoulder pain can indicate a more serious condition when it begins to worsen with time or is particularly noticeable the night after a match or practice. Another example of a tennis-related shoulder injury is "dead-arm syndrome," where the arm is difficult to move or lift. These symptoms may indicate your shoulder injury has gone beyond temporary pain and has developed into a rotator cuff injury such as an impingement or torn rotator cuff muscles. If you do experience initial signs of shoulder pain when playing tennis, you may wish to start performing exercises to strengthen the rotator cuff muscles. Many professional tennis players incorporate rotator cuff training into their toning exercises. Examples include holding a resistance band with your palms facing up and your upper and lower arm at 90 degrees with your elbows tucked in toward your torso. Pulling your wrists away from each other can target the rotator cuff muscles. Another exercise involves lying on your side with a lightweight hand weight -- between 2 and 5 lbs. -- with your upper arm tucked to your torso and your lower arm bent and facing forward. Bringing your hand toward the wall behind you can target the rotator cuff.